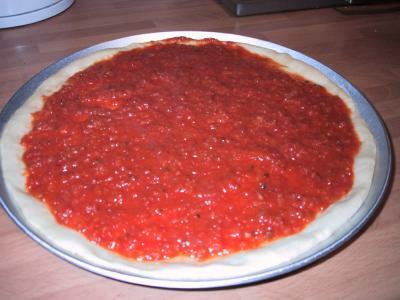 The tomato sauce that is used as a base for all pizzas. Chop the onions and garlic, fry them in olive oil until translucent. Then add the spices and tomatoes. Let it simmer for half an hour to reduce the water content, then take a blender to it and let it cool down. Chop the onions and garlic, fry in olive oil, and add the tomatoes and spices. 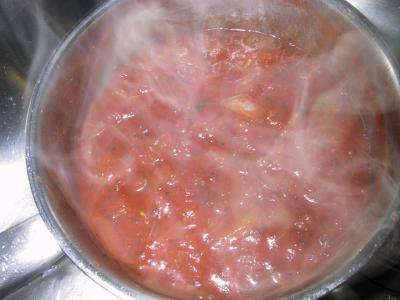 Let simmer for half an hour to reduce the water content. Then take a blender to it and let it cool down. Spread the pizzaiola on your base - best done by putting a blob into the middle and then moving the pan quickly back and forth. Or just use a tablespoon to spread it. Put on your toppings. 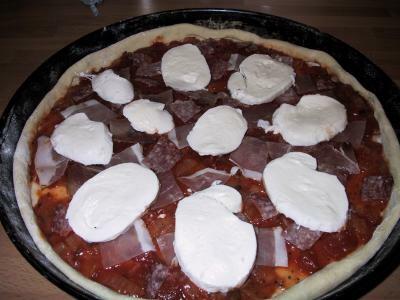 Don't overdo it - stick to 2 or three toppings and don't put too much on. An overloaded pizza will get soggy. Put on your cheese. I love mozzarella, but it is entirely up to you what you want to use. Cheddar works quite well, too. Or mix some cheeses - e.g. mozzarella and stilton. 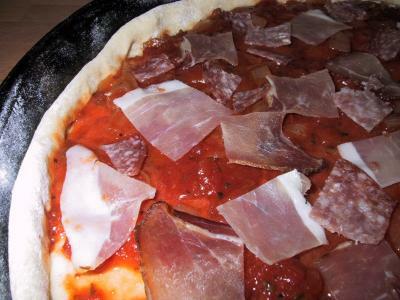 Put the pizza into your pre-heated oven (heat up to the maximum - whatever your oven is capable of doing!). After roughly 12 minutes, the pizza is done. 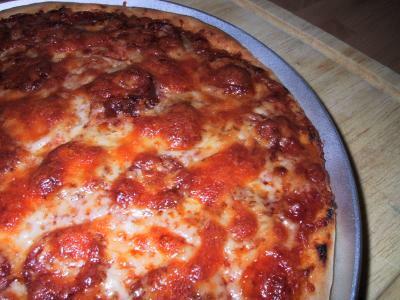 Here is quite a different pizza - no pizzaiola, and different vegetables and cheddar cheese. 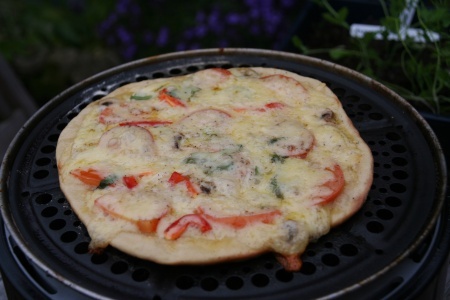 This pizza was cooked on a Cobb Barbequeue for 15 minutes with the lid closed. 2 Love your recipes, you'v taguht me how to cook! So many thanks for that! but just wondering any chance you can do some vegeterian main dishs in the future? I like how you present your dishs, so would be pretty cool, something really appetising. milk is fine(but maybe cool to use nut milks with a dish? and show me a reason to go vegan isnt goign to make me give up nice food) i'm just a strictly no meat guy at the moment, but would be cool to see how creative I could get with vegeterian/vegan dishs. But anyways wether you do or don't, thanks for the vids man, eat alot better because of you. 9 Love your recipes, you'v tgauht me how to cook! So many thanks for that! but just wondering any chance you can do some vegeterian main dishs in the future? I like how you present your dishs, so would be pretty cool, something really appetising. milk is fine(but maybe cool to use nut milks with a dish? and show me a reason to go vegan isnt goign to make me give up nice food) i'm just a strictly no meat guy at the moment, but would be cool to see how creative I could get with vegeterian/vegan dishs. But anyways wether you do or don't, thanks for the vids man, eat alot better because of you.